Memories, this Norman Rockwell painting, appeared on the cover of The Literary Digest published June 25, 1921. The alternate title for this illustration is Old Woman Reading Love Letters in Attic. This illustration was Rockwell's twenty-seventh picture featured on the cover of The Literary Digest. 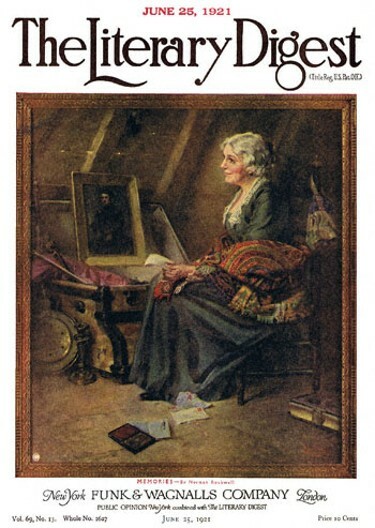 Rockwell artwork was featured on the cover of The Digest twelve times just in 1921. A Rockwell cover was published once a month just on this one magazine alone! Beginning with his first cover illustration in 1918, Boy Showing Off Badges to the last, The Night Before Christmas in 1923, Norman Rockwell artwork was published on The Literary Digest cover forty-seven times in all. This painting also appears on page 56 of Norman Rockwell, A Definitive Catalogue by Laurie Norton Moffatt. The original oil on canvas painting, 30 x 25 inches or 76 x 63.5 cm, is part of a private collection. Norman Rockwell brings forth bittersweet memories with this painting, Old Woman Reading Love Letters in Attic. Memories was only one of 47 Norman Rockwell Literary Digest covers; here is the list of more Norman Rockwell Literary Digest scans. This older woman is sitting in her attic reading old love letters she has retrieved from inside a trunk. There are envelopes strewn on the floor. There is a portrait of a man propped inside the lid of the trunk. The light source seems to be coming from off the left side of the canvas. Rockwell paints lots of old, though peripheral, items throughout the attic. The older woman wears a pensive look on her face. It is hard to tell whether reading the love letters are making her happy or sad... or both.